The bed was very comfortable and big! The bath was particularly relaxing. It's not that far from the main spots of the city, so the walk there can be enjoyable. Rooms are larger than ibis and other similar hotels. Kitchenette is a great bonus. Parking is very secure and very reasonably priced. Quiet neighborhood and not far from the train station. Clean and comfortable room. Good appart'hotel, within walking distance of the city centre and with parking available on site. Generously sized room. Good value for money. Clean. The most helpful thing for me was a handy-phone. I didn't know that they provide the phone for each room. We can use unlimited data, so I canceled my plan to buy a sim-card. I have only used the phone during my stay. Huge family room with comfortable beds. Desk area, drawers and open hanging areas. 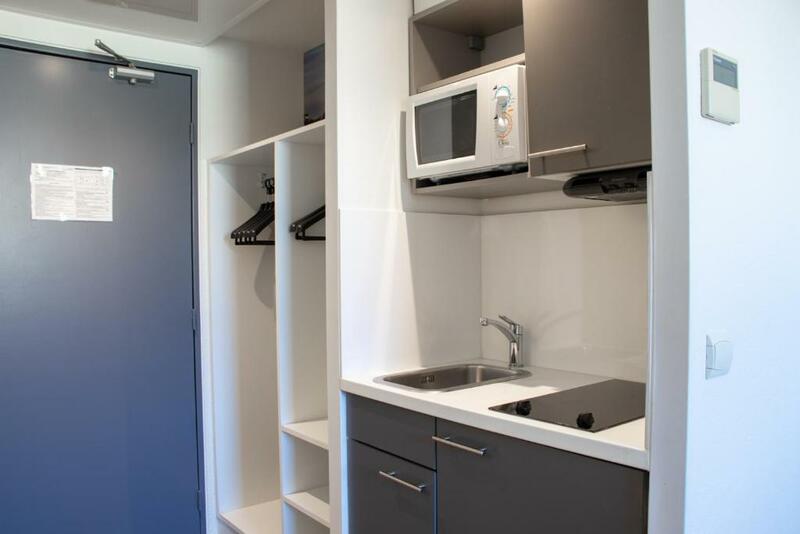 KITCHENETTE- could have done with a tea towel, bowls for cereal and cleaning up cloth otherwise, good size fridge, microwave, fridge but minimal space to prepare food. Parking was secure and seemed adequate for the size of the property. Small area of 'garden' for late night doggy walks. Good location for getting in to Bordeaux centre. The lication is good, around 5 mins walk to the tram station. The room is clean and with small cooking facilities. staff at front desk were friendly and helpful. Location was good with a bus outside and a tram about 5 mins walk away. Room a decent size and the hotel felt secure with codes to get into the property. The hotel was quiet. Lock in a great price for Victoria Garden Bordeaux Centre – rated 8 by recent guests! This residence is located in central Bordeaux, a 15-minute tram ride from the National Opera House and Saint-André Cathedral, and 5 mi from New Bordeaux Stadium. It offers air-conditioned apartments. An LCD TV and Wi-Fi access are provided in each apartment at Victoria Garden Bordeaux Center. The bathroom includes a hairdryer and the kitchenette has a microwave and fridge. A buffet breakfast is served every morning in the breakfast room at Victoria Garden Bordeaux Center. Place de la Victoire tram stop is 1,650 feet away, providing direct access to the Musée d’Aquitaine. Nansouty Saint-Genes is a great choice for travelers interested in monuments, old-town exploration and city walks. When would you like to stay at Victoria Garden Bordeaux Centre? -a kitchenette including a microwave, fridge and ceramic hotplates. Please specify your bedding preference in the special requests box when reserving. Please note that the bedding types are subject to availability and they have to be confirmed by the property. Please note that there is no separate bedroom. This suite includes a seating area with an armchair, a Senseo coffee machine and a courtesy tray. This studio features a electric kettle, air conditioning and kitchenette. 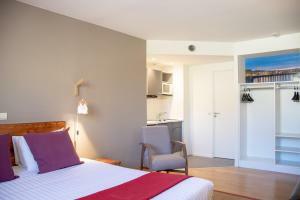 Only few minutes’ walk from La Victoire tram stop, your Apart'Hotel Victoria Garden Bordeaux*** offers comfortable suites featuring a modern style. From there, discover Bordeaux with St Andre Cathedral and the historic less than a 15 minutes tram ride away. Your Apart'Hotel Victoria Garden Bordeaux*** combines the practicality of a furnished rental (bathroom, equipped kitchenette) and the comfort of hotel services (reception, housekeeping, breakfast, car-park). It’s the ideal solution for tourism or professional stays. Your Apart’Hotel Victoria Garden Bordeaux*** brings you a warm, spacious and functional living space in city centre, to manage your stay freely. A few walk away from the Victoire Place and its tramway station (line B), your Apart’Hotel Victoria Garden Bordeaux*** is ideal to stroll in the historic centre of Bordeaux, and to appreciate the new face of the city, its docks, its monuments, and its beautiful restored facades. From your Apart’Hotel Victoria Garden Bordeaux***, you can easily schedule various excursions in Gironde : from the great wine properties of Bordeaux (Médoc, Saint-Émilion, Pessac-Léognan, Sauternes...) to the endless beaches of the Atlantic coast (Soulac, Lacanau, Bassin d'Arcachon, Cap Ferret...). House Rules Victoria Garden Bordeaux Centre takes special requests – add in the next step! Victoria Garden Bordeaux Centre accepts these cards and reserves the right to temporarily hold an amount prior to arrival. Saturday and Sunday: 08:00 to 12:30 and 16:30 to 21:00. If you plan to arrive outside the opening hours, please contact the hotel for instructions regarding late check-in procedure. Please inform Victoria Garden Bordeaux Centre of your expected arrival time in advance. You can use the Special Requests box when booking, or contact the property directly using the contact details in your confirmation. Little thin walls and couple lights were not working but nobody’s fault! It’s really close to the centre. Lovely, clean and modern apartment . Staff couldn’t be more helpful . Would 100% come back. Asked for a quiet non smoking room was e-mailed by hotel saying no problem but room reeked of stale cigarettes and the adjoining room TV and occupants could be heard. Had to turn fridge off as the motor was so loud. Location good secure parking a necessity. Room size good and decor good. People in the hall and corridor are very easily heard, our neighbors woke us up twice. The location. The area seems very rundown and the sidewalks uneven and neglected. The shower didn't have a decent enough angle for the water to drain, so we had to be careful or we'd flood the bathroom and bedroom. Correctly angling the shower head fixed the problem. Very clean, friendly staff, on-site parking, comfy bed, nice bathroom, large room and bathroom. A problem we had, being on the top floor within 3 metres from the lift and it's machinery above us, there was some associated noise which did finish eventually. We didn't complain because nothing could be done by the staff available Very basic kitchen. The area is somewhat dodgy. Everything was very clean, the beds are comfortable and the shower is spacious. The location is really perfect and the staff too. Many thanks. We had a room just next to the lift so it was a bit noisy. Great staff, good location close to Victoire Square. Surprisingly nice greeting. Very clean and good-looking room. Fairly good location.